As Family Dog is a service to help parents choose the right dog for them and their family, we have a selection of dogs of different shapes and sizes, breed, age, coat type, and character, to help at the workshops. Our workshop dogs have been selected specifically for helping parents develop their skills for training their own pet dog. Widget is a Cocker Spaniel who came to the charity as an 8 week old puppy. After 14 months of being cared for by one of our volunteer Puppy Socialisers, Widget came into our Banbury Centre and began his training. Widget has learnt skills relevant to him in his role as one of our Family Dogs. It’s nice to have a smaller breed of dog on the team for the parents to observe and interact with as this is sometimes more suitable for their family’s lifestyle. 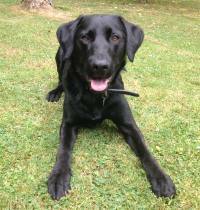 Fidget is a Labrador x Collie and came to the Family Dog service as a puppy from Battersea Dogs Home. He has settled well into his routine and loves exploring new things. Fidget is the youngest member of our Family Dog team and is having a lot of fun, especially playing with squeaky toys, which are his favourite! The team are currently working on introducing Fidget to the workshop environment and building up his confidence. We expect to be seeing more of him in the months to come. Siren is a Labrador and is our most experienced Family Dog. Siren came to Dogs for Good when she was an eight week old puppy and has been attending the Family Dog workshops for the last couple of years. Siren takes everything in her stride and always enjoys meeting new parents and our other Family Dogs. Siren settles quickly in the workshop and enjoys participating in the various demonstrations. She also loves a good fuss from all the parents and gets very excited when greeting them!